Students from The Escalera Program Visit Northern California Colleges, and get a tour from non other then Former Synergy Scholars. Welcome to Synergy Quantum Academy! Synergy Quantum Academy opened its doors on September 7, 2011 to 400 freshmen, sophomores, and juniors. In 2018-19, we serve 540 students in grades 9-12. We are one of two small public schools located on the Dr. Maya Angelou Community High School campus in South Los Angeles. As a S.T.E.M (Science, Technology, Engineering, and Mathematics) focused high school, our goal is to prepare our students to serve as innovators in these fields as they move through college and career. We are also mindful of the importance of inter and intrapersonal relationships and expect that our students will work to bring out the best in themselves and each other every day. To this end, we provide rich, comprehensive counseling services to our students, including academic, collegiate and socio-emotional support and/or advising. 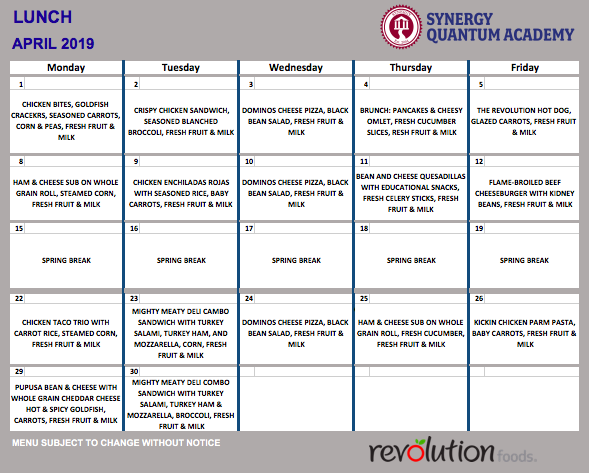 Parents play an important role at Synergy Quantum as well and participate in activities such as Parent Conferences (held once every semester), and the monthly Coffee with the Principal. In addition, numerous events such as the Parent Book Club and Ambassador Program are available to all Synergy parents and families and are headed by Synergy’s Family and Community Outreach Manager. Synergy Quantum’s goal is to provide an outstanding school program and experience for our students. We strive to help our students become caring, confident young people who are skilled critical thinkers and creative innovators who will prove successful in college and career. 2019-2020 New Student Applications Available NOVEMBER 1st! 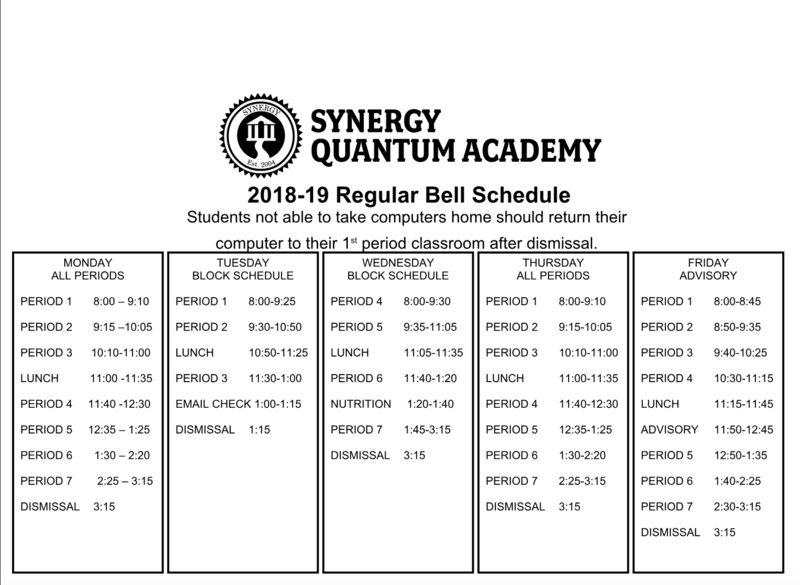 Synergy Quantum Academy will begin accepting applications for 9-12 enrollment in the 2019-2020 school year on November 1, 2018! Click the ENROLL button for more information. Attention Parents Illuminate is no Longer supporting Android and i Phone. However, parents do not need the app to access Illuminate from a smartphone. The Parent Portal is built to run on mobile devices. It will size adjust to fit all sizes of mobile devices. Parents can log in using the synergy.illuminatehc.com web address. They can bookmark it on their phone or tablet browser for easier access. Synergy Academies is a non-profit charter school operator whose mission is to create and share solutions that eliminate the achievement gap. Synergy was founded in 2004 by two former teachers, Dr. Meg Palisoc and Dr. Randy Palisoc, who started Synergy Charter Academy (Synergy’s elementary school) in the heart of South Los Angeles to prove that inner city students could achieve academic success regardless of their backgrounds, and to share out their best practices once their students achieved academic success. Synergy implements instructional strategies that integrate technology and focus on developing strong literacy and math skills. After its first year of operation, Synergy students’ standardized test scores were the highest in the community. Within four years, Synergy Charter Academy scores were near the top 10% of the state, and the school has remained the highest-performing, fully implemented K-5 school in South Los Angeles for the past eight years. Synergy increased its capacity to educate over 1,300 students per year in grades K-12 by partnering with Dr. Barbara Shannon to open a middle school, Synergy Kinetic Academy, in 2008, and a high school, Synergy Quantum Academy, in 2011. Since Synergy's middle and high schools are much larger than its elementary school, the majority of Synergy’s secondary students do not come from Synergy’s successful elementary school, but instead, they come from struggling neighborhood schools and are often performing three or more grade levels behind in reading and math when they first enroll. By again leveraging the use of technology and focusing on strategies that develop and strengthen literacy and math skills, Synergy is bringing these students up to grade level and preparing them for high school graduation and college.